for all you non believers here is how height is ment to be measured, Ask someone to help you measure your height. Then go and find the following: * a measuring tape (just make sure it’s one that measures centimetres if you want to calculate your BMI); * a pencil that has been sharpened; * a ruler or any other horizontal bar or rectangular block of wood or plastic that isn’t too thick. Keep these items close by. ⊗ Actors Amitabh Bachchan- 6″3 (original height-6″0) Vinod Khanna- 6″0 (original height-5″10) Shatrughan Sinha- 6″1 (original height-5″11) Akshay Kumar- 6″0 (original height-5″9) Jackie Shroff- 6″0 (original height-5″11.5) Bobby Deol -6″0 (original height-5″8) Sunil Shetty- 5″11.5 (original height-5″9.5) Sunny Deol -5″11 (original height-5″7) Anil Kapoor -5″11 (original height-5″9) Akshaye Khanna- 5″9 (original height-5″6) Salman Khan -5″8.5 (original height-5″5.5) Saif Ali Khan -5″8 (original height-5″6) Govinda -5″8 (original height-5″4) Shahrukh Khan -5″8 (original height-5″6) Rishi Kapoor- 5″7.5 (original height-5″6) Amir Khan -5″6 (original height-5″5) ⊗ Actresses Sushmita Sen-5’9.5″ (original height-5″8) Pooja Batra-5’9″ (original height-5″6.5) Tabu-5’8″ (original height-5″4.5) Sonali Bendre-5’8″ (original height-5″5) Shilpa Shetty-5’8″ (original height-5″5.5) Aishwarya Rai-5’7.5″ (original height-5″6) Sridevi-5’7″ (original height-5″3) Rekha-5’7″ (original height-5″4) Raveena Tandon-5’7″ (original height-5″2) Karishma Kapoor-5’6″ (original height-5″3) Madhuri Dixit-5’5″ (original height-5″5) Juhi Chawla-5’5″ (original height-5″1) Kajol-5’5″ (original height-5″2) Mamta Kulkarni-5’5″ (original height-5″0) Urmila Matondkar-5’4″ (original height-5″1) Twinkle Khanna-5’4 (original height-5″2) Popular Indian Acting legend. He says, “I’m six feet,. 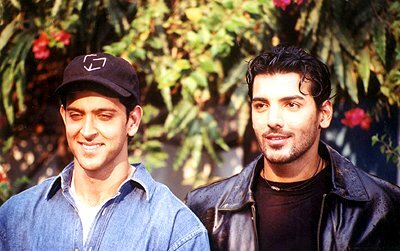 They’ve got to look up to me” Here is the picture of Hrithik standing along side John Abraham. If you use a ruler to draw a line from John’s eye level, you can see that John is actually taller by a good inch (possibly even more) than Hrithik. John is a model, and having studied the profession of modelling, they cannot bluff about there height. Actors however, have that option. Here is the link below. Copy it.